I enjoy survival horror. Simply put: I enjoy the thrill of having the hordes of zombies and ghoulies running after me with their mindsets focused on my destruction with just the right creepy atmosphere to keep me on my toes, pure simple. Being alone in the dark, with my own life on the line, is a magnificient experince as I'm sure you'll all agree. But I will be honest with you, the majority of horror games I've played haven't really done that. I haven't been playing them for a while, my first horror game being Resident Evil 4 back in 2006, but having played a few since then, most notably Dead Space, I can't hep but wonder where my enthusiasm has gone. The majority of games that try to be scary nowadays try to do so without sacrificing the gameplay. Gameplay being subpar had been a characteristic of survival horror ever since Edward Carnby crept though the halls of Derceto back in Alone in the Dark in 1992, up until the hunting of Las Plagas in Resident Evil 4 in 2005. RE4 is considered to be the turning point of the franchise, the game that overhauled the series from being restrictive and slow paced, to a fast paced thrill-a-minute run for your life. And while RE4 was more thrilling than creepy, it still managed to keep me excited and on my toes throughout. Then, a few weeks ago, I downloaded Dead Space to my 360. I had heard almost nothing but praise towards it, and decided I was going to give it a go. I am now in the middle of the seventh chapter, over halfway though the game, but I just haven't really been all that impressed. There have been a few brief moments of terror, the fight with the invicible necromorph was fairly exciting, but I haven't really felt genuine fear. And soon after, once I no longer felt that I was in extensive danger, the repitition of the combat system, even with the dismemberment, started to seep in. The other horror game in recent memory that has sticked out in my mind is Left 4 Dead. L4D is widely considered as being one of the best co-op games of the last few years, but it also was genuinely thrilling as well. It had an excellent sense of pacing and when it works, it works very well. Just a few weeks ago I was playing through Swamp Fever on Expert in L4D2. We had just barely defeated two tanks at once and all four of us were making a run for Virgil's boat. All the tension of the finale had been building up over the course of the fight. My knees were starting to wobble, my arms' muscles were tightening. The excitement was incredible. I was screaming into my mic, "PIPE BOMB OUT!" as we ran to the boat. All four of us got on, and as the credits rolled, I remember shouting out loud, "THIS IS WHY I PLAY THIS GAME!" Then after I had calmed down, I thought, "That IS why I play this game." The tension building up after a heated fight with genuinely threatening monsters, and the overwhelming sense of satisfaction after it is all said and done. That's why Dead Space doesn't appeal to me as much as L4D or RE4. There's no proper pacing, no build up of tension, I get no sense of dread. It specializes in closet scares, something that has never worked on me at all. I've played the Resident Evil remake on GameCube and was rarely scared at all even though there were plenty of moments that have surprised many. 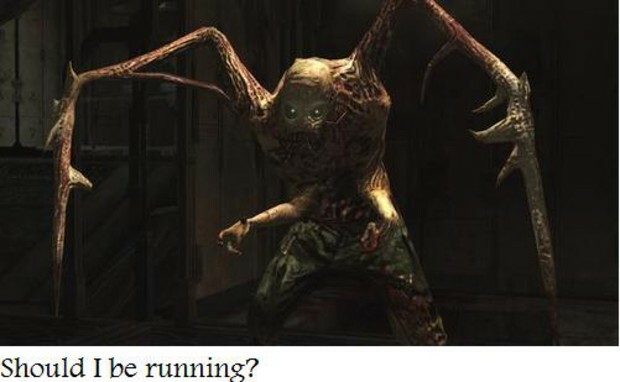 I've played RE4 twice and still manage to find that moment where those odds are against me, they're closing in on all angles, and the chance of survival is seemingly slim. Which makes it all the more satisfiying when survival is exactly what happens.